This is my second card from the new Christmas Maggies; such a sweet little stamp. Her wings cry out for Glamour Dust and Stickles and we are allowed to use this liberally at Christmas! I admit to going a bit overboard with this card and adding lots of seasonal joy. However, I held back on lace this time! The Wild Orchid Craft flowers and holly leaves have added berries and pine cones. The shabby bark stars have white pearls to match the pearl string draped around Tilda. The seam binding bow holds a heart and an angel charm. Dies; The card was cut with GoKreate dies, matted to textured white card. I think the border die is an old Marianne die, not sure...Snowflakes and main doily die are Joy Craft. Angel Tilda was painted with distress inks with added liquid pearls and Glamour dust. It will be on sale on eBay in Magnolia Tilda Cards, from Friday. 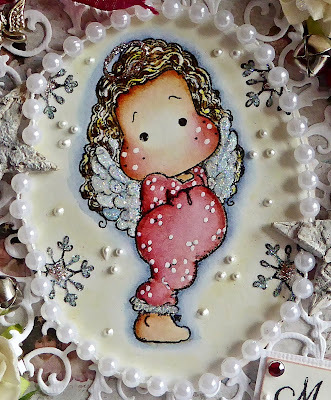 Happy Dance,; my new stamps are here and they are so sweet and Christmassy! I had to stamp them up right away, and so far I've made two cards. One with the Christmas Angel Tilda and another with the Gingerbread Tilda. So today, I thought we would do the cute little Gingerbread Tilda. I've given her a gingerbread man to hold, and added two peppermint sticks to match the sentiment. Isn't this stamp a cutie! So lets list; a triple seam binding bow with pearly heart, A double sided Christmas stocking charm, with gingerbread man and peppermint canes, Roses and flowers from my stash with a cinnamon stick and tiny pine cones...collected on my travels; and berries. The lace is from the Ribbon Girl as is the seam binding and Glamour Dust. Dies: Card cut with GoKreate dies, Fancy star and circle are Joy Craft dies and the holly leaves. I believe are Marriane dies, though I've had them so long its hard to remember. Those gorgeous papers are from Maja Design of Sweden, layered onto white textured card. Gingerbread Tilda was stamped and painted onto watercolour paper. The medium is Tim Holtz distress re-inkers with added Glamour dust for sparkle and liquid pearls for snow. That's all for today...thank you Janette for being my one and only follower. This is my latest Magnolia Tilda Card for Christmas. I've made it a little bigger than usual by adding die cut borders and papers. Its a little bit special. 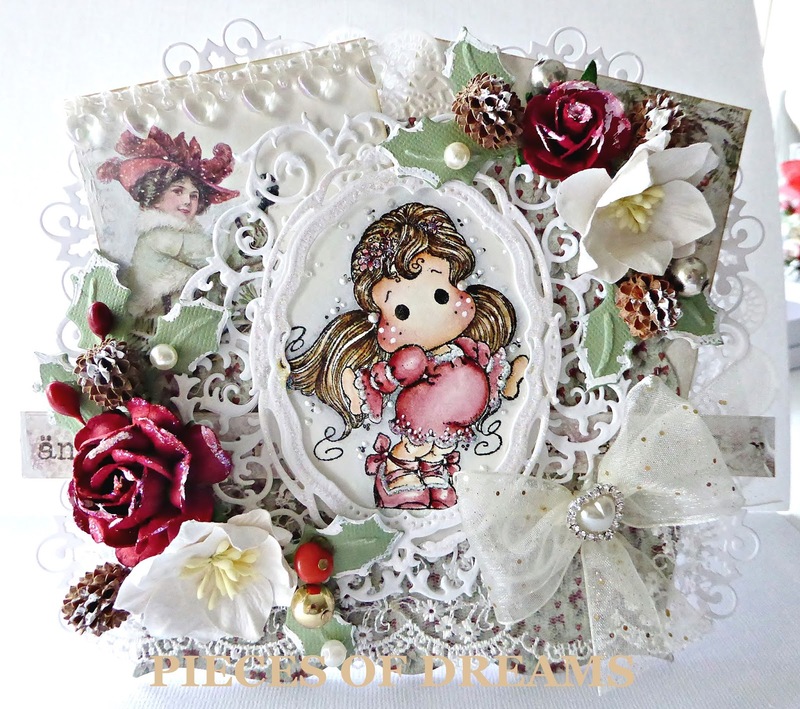 The Papers are from Maja Design and I've added white Christmas roses and pine cones, berries and holly leaves. Tilda has been painted with distress inks.